The Buffalo Teachers Federation has delivered 35,000 free books to city school students. It's part of a national program called 'First Book'. WBFO'S Focus on Education reporter Eileen Buckley was at BEST PS#6 as books arrived for some of the youngest students. 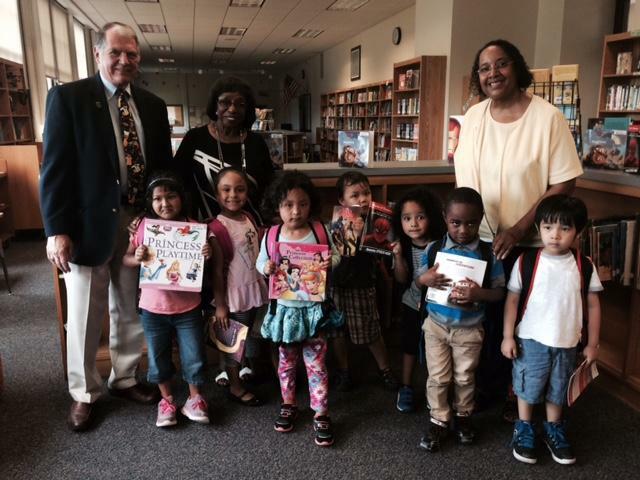 Pre-K students proudly show off their new books delivered by the BTF to the BEST School. WBFO'S Eileen Buckley reports on the delivery of free books to city school children from the Buffalo Teachers Federation. Seven Pre-K students couldn't contain their excitement has they laughed and play games with BTF President Phil Rumore. 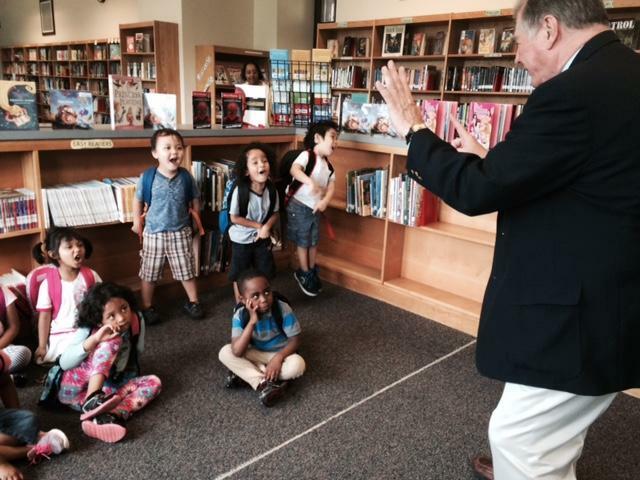 BTF President Phil Rumore plays a game with the Pre-K students before they selected their books. Rumore arrived in their classroom with books. The union leader has set goal of making sure that every city school student receives their very own 'age appropriate' book, encouraging them to read. "They can have any of these books," said Rumore as he pointed to the books he brought for the young children. The BEST School Pre-K students were allowed to select from several books, some about snow white, princesses and Spiderman. 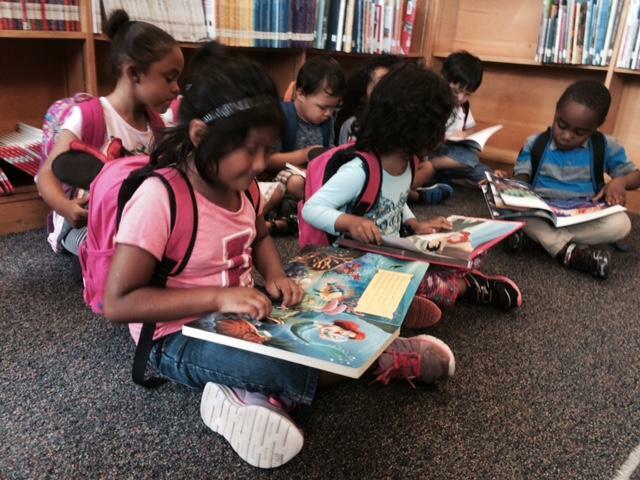 BEST school Pre-K students were allowed to select from several books to keep. "Ginger Bear, Spiderman!," said the children pointing to their new books. Many of the Pre-K students at the BEST School are immigrant and refugee children. Teacher Marilyn Foote-Kragbe said 80-percent of her students are non-English speaking children, and when the arrived at the beginning of the school year, many could not read. But she reads stories each day to the children to develop their English and reading skills and it's working. "I don't just read a story. I act it out and the children are there with the mouths hanging open, their eyes big as saucers," said Foote-Kragbe. "And I have one little girl who was zero, zero, zero -- she couldn't even say -- what is your name -- she just looks at you like that -- and she had a perfect score in the ELL exam." WBFO News asked the teacher how the district could assist her in the classroom when working with the English Language Learners. "I want the parents to really be a strong supporter of their child and we always have this problem where we don't have a translator to translate to the parents so they will know what to do and if I can get a translator for all my students," stated Foote-Kragbe. BEST school Pre-K students with BTF President Phil Rumore, Buffalo School Board Member Mary Ruth Kaspiak & Teacher Marilyn Foote-Kragbe. The BTF has delivered the books for the third straight year and that brings the overall total of free books to Buffalo school children to more than 100,000. And to give you an idea of just how excited and happy their children were about receiving their books, some stepped forward and gave Rumore a hug to thank him.